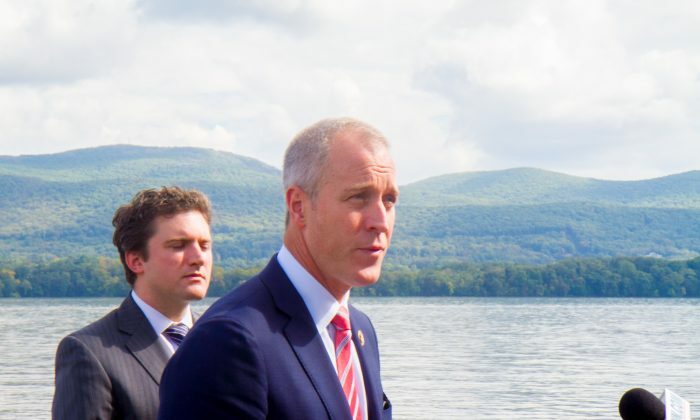 NEWBURGH—Speaking on the banks of the Hudson River Oct. 3, Rep. Sean Patrick Maloney announced legislation he’s created that would limit the locations oil barges could anchor, saying it was an environmental, health, and economic threat to the area to have vessels with hazardous or flammable material on the river. The legislation comes after the U.S. Coast Guard, at the request of trade industry groups, sought to put new anchorage grounds on the stretch of river between Kingston and Yonkers. This would allow “for a safer and more efficient flow of vessel traffic” the Coast Guard said in its rulemaking proposal. Maloney and others argue that building more anchorage sites along the river would increase the capacity for such vessels, which would increase the likelihood of a spill or other accident, and could ruin the aesthetics of the river. The legislation, called the Hudson River Protection Act, would prohibit new anchoring sites from being created within 5 miles of endangered species habitats, sites listed on the National Register of Historic Places, a nuclear power plant, or a superfund site, which covers the entire stretch from Kingston to Yonkers, Maloney said. In a letter to the Coast Guard, the Maritime Association of the Port of New York/New Jersey Tug and Barge Committee disagreed with that statement, saying the amount of crude oil the U.S. produces will only increase since the U.S. lifted a 40-year ban on American crude oil exports in January. The desire to expand these sites is predicated on the belief that we’re going to have large increases of crude moving down the Hudson River. The committee also argued that increased anchor locations along the Hudson would increase safety because commercial vessels are only allowed to anchor outside federal anchorage areas in the case of emergency. This leaves them with seven anchorage sites between Yonkers and Albany, it said, so instead of anchoring when it gets dark or in inclement weather, they are forced to continue on. The committee requested 30 more anchorage sites, including ones in Newburgh and Kingston. Maloney said he’s not against having some oil cargo on the river, especially if it keeps energy prices low and offers good jobs, but the scale has to be taken into account. “The question is whether you’re going to so overdevelop, or so overutilize a particular transmission method that you pose a real risk to everything else we care about in the river,” he said. The legislation was introduced to the House of Representatives on Sept. 28.